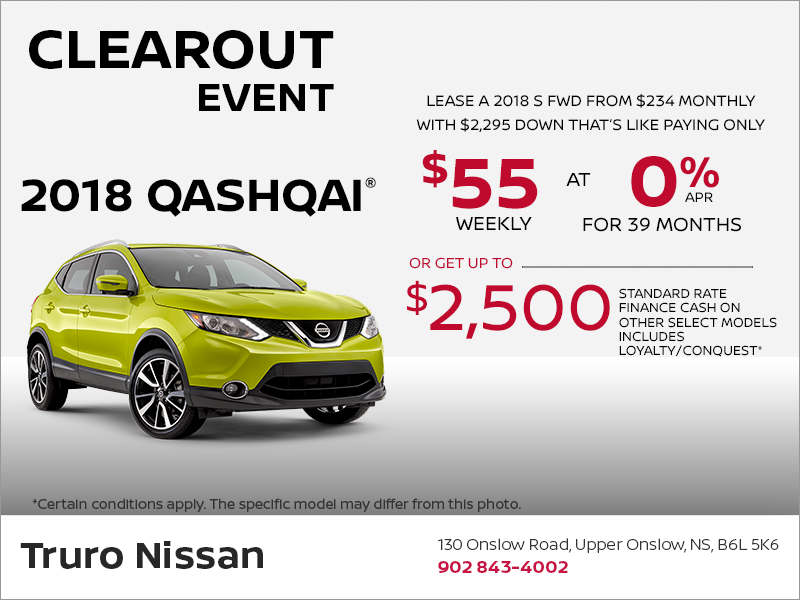 Lease a 2018 Nissan Qashqai S FWD from $55 weekly for 39 months at 0% APR with $2,295 down! Certain conditions apply. This offer ends on August 31st, 2018. Offers available from August 1 – August 31, 2018. +Standard Rate Finance Cash discount of $3,000/$2,500/$4,500/$6,000/$3,500 (including $0/$500/$0/$800/$0 in Loyalty/Conquest Cash) is applicable only to customers financing a 2018 Sentra/2018 Qashqai SL AWD/2018 Murano Platinum AWD/2018 Pathfinder Platinum/2018 Rogue Platinum models through NCF at standard rates. 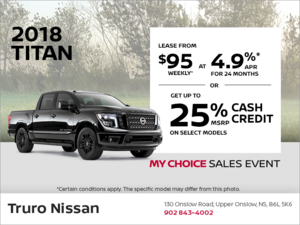 Offers are available on approved credit through Nissan Canada Finance for a limited time. The cash discounts cannot be combined with lease or finance subvented rates or any other offer. Certain conditions apply. ^Payments cannot be made on a weekly basis, for advertising purposes only. Representative monthly lease offer based on a new 2018 Qashqai S FWD at 0% lease APR for 39 months equals monthly payments of $234 with $2,295 down payment, and $0 security deposit. Lease based on a maximum of 20,000 km/year with excess charged at $0.10/km. Total lease obligation is $11,410. Lease Cash of $500 is included in the advertised offer.